I first found Ivy Inspired last year and fell in love! Hi, I’m Emma. I am the wife of a dairy farmer and we have two boys (age 3 & 4). We live in Ngatea/Thames & like to spend our spare time exploring the country. We are currently working on converting a bus into a holiday house and will eventually park it up on some off-grid land we have in Coromandel. When did you start Ivy Inspired? Ivy Inspired was started one year ago, I should really find out the exact date and throw a party. I have been making hessian table runners & bunting flags for around five years. I originally started after I made them for my wedding in 2013 and had to get rid of all the extra hessian fabric I had bought. I got so many requests that I just never stopped. I started under the name The Wedding Bunch which was a business I ran with my sister for about 3 years. Mostly selling wedding flowers and hiring props until distance, kids, and family commitments made it hard to continue. I then went out on my own and Ivy Inspired began. I took over the lounge in our home, invested in a few industrial machines, and sped up my production process. Now I have a larger range of products including ribbon backdrops, rose globes at Christmas time, a bigger selection of hessian options, and vinyl cutting machine to personalise items. 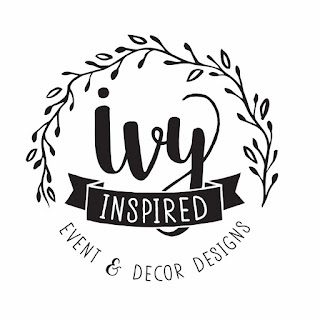 My business was named Ivy Inspired because I have always felt encouraged and inspired by my family & their talents. In particular, my grandparents, Ivy & Aubrey. They were both very creative people and I was very privileged to inherit all of Grandma's sewing and craft supplies & a huge portfolio of sketches drawn by Grandad. I love that even though they are gone now, in a way I still get to share this with them. What is your favourite part of running your own business? I’m not gonna lie, I love getting to do things the way I want to. I love being able to create whatever I like. And mostly I love that I have the option to spend as much time as possible with my family. What is one thing you do daily to make your business work? I try to learn something new every day. I read blogs, browse websites, watch videos etc. anything that I think will help me to learn something. Even if it isn’t completely relevant to my business. Learning ignites passion and gives me the confidence to try new things. Where to from here with Ivy Inspired? Liked by Becky 2018. Simple theme. Powered by Blogger.